Samsung HP-S4252 is a 42-inch plasma High Definition HDTV with integrated HD ATSC tuner, and the plasma HDTV specifications feature Samsung Digital Natural Image engine with digital noise reduction, 1024 x 768-pixel resolution, 1300 cd/m2 brightness, 10,000:1 contrast ratio, 175-degree viewing angle, connection options of 2 HDMI, 2 component, 2 composite, 2 S-Video, 1 digital coaxial and 1 digital optical, has two stereo speakers which is 10 watts apiece (20 watts total) and supports SRS TruSurround XT virtual surround sound. 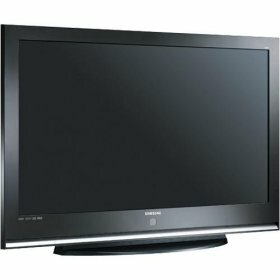 Samsung HDTV measures 41.5 x 30.1 x 13.4 inches (WxHxD) with stand. Sci-Tech Today reviews Samsung 42″ HP-S4253 HD plasma TV and concludes with rating of 4.5 out of 5 that Samsung’s Gen-5 HD Plasma TV offers the latest HDTV video technology at a competitive price. Beyond image quality, features like split-screen and picture-in-picture make the HP-S4253 easy to recommend. The good points are bright, clear picture from 13-bit processing, split screen and picture-in-picture features. While the bad points are plasma technology presents some risk of burned-in images.